We wrapped our first week of shooting Mystic Cosmic Patrol. It was all overnights, which was a bit tough to get used to, but we managed to finish on time and even got out early on the last day of the week. Our locations are complete and now we're shooting out the rest of the episodes on our soundstage. We're also back to regular days. The script is funny and I've enjoyed seeing the actors bring their own comedic elements to the scenes. Probably the most challenging aspect so far has been lighting the night exteriors with a small lighting package and G&E crew. I always worry about trying to make the lighting look natural, but over the weekend I watched some episodes of Parks and Recreation that had nighttime exteriors and I noted that even at the budget and skill level of a larger production like that, they were also fighting against having an obvious lighting source or looking muddy, so I think I did relatively well. I also tend to be hyper-aware of what I'm shooting because I know what and where the sources are, even though it may seem to the end viewer to be fairly natural. It's been fun so far and I look forward to seeing the finished episodes. With the quality of the script, I hope the show gets picked up because it's pretty wildly entertaining. 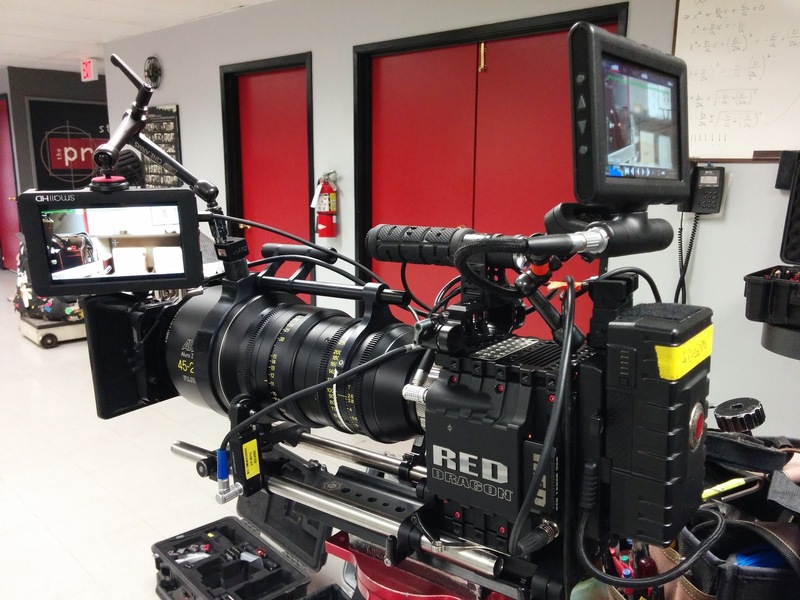 We're shooting on the RED Dragon as A-Cam, with a RED Epic serving as B-Cam, all on Canon EF lenses. My A-Cam is kitted out with a Teradek Bolt 600, which has been fantastic, and a SmallHD DP7-LCD. B-Cam has been rocking a Paralinx Arrow and the 1st AC has been impressed with the clarity of the Atomos Shogun monitor/recorder's 1920x1200 screen. 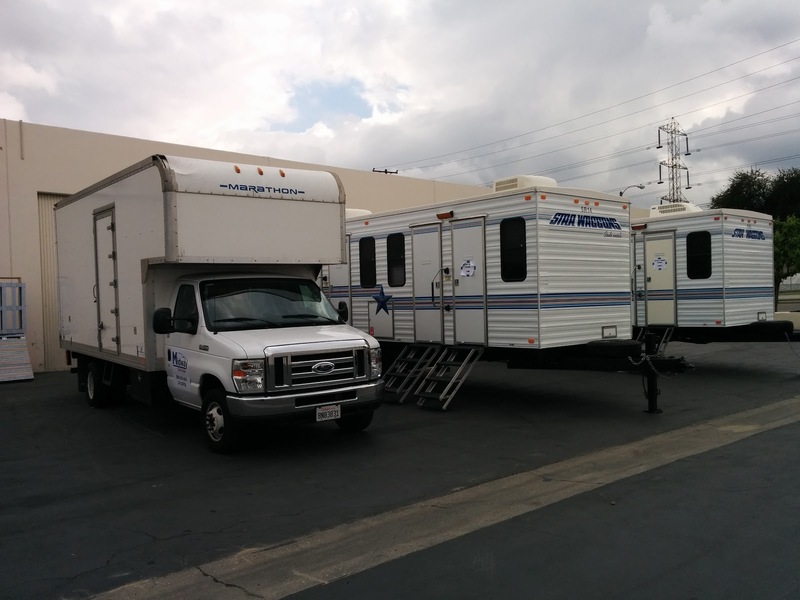 I can't show you any footage from the show, so here's a boring shot of the cast trailers instead. I've been busy lately with preproduction for a series pilot of a show called Mystic Cosmic Patrol, a throwback to the Japanese Power Ranger style of television, but with humor aimed more towards an adult market. The concept and script are pretty fun, so I'm excited to get this project made. We had a tech scout today and will begin shooting mid next week. In between prepping for that show, I made a quick trip over to Dallas to camera operate an Asahi beer commercial. It was a fun shoot and we got to build up my Dragon with a nice Arri/Fujinon 45-250mm lens. My AC had a Heden Carat wireless focus unit and I was pretty impressed with the responsiveness and smoothness. I've been looking around for a nice wireless FF, so this may have to become a piece of my kit.